how thankful i am that God delights in transforming lives. 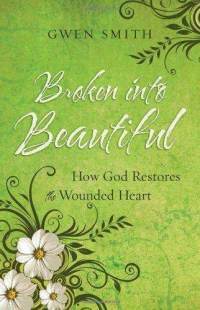 in this book, singer and songwriter gwen smith tells the real-life stories of women with shattered dreams, shameful secrets, damaged souls and the God who makes them beautiful again. her own story is one of heartache and inspiration. this book will help you to believe His truth and to remember He gives us grace even when we don't deserve it. we have a beautiful Savior who became broken for us so that all who are broken can be transformed to reflect His beauty.